To Make Any Occasion Extra Fun! 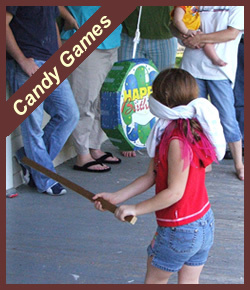 Candy games are such a "sweet" and fun way to improve any party or special occasion! Of course, chocolate games are my absolute favorite, but they could pose a challenge in the middle of summer, particularly if your event is an outdoor gathering. If that situation arises, consider a game using hard candies or even pictures of candy and chocolate if circumstances demand it. You can always just give out goodie bags at the end, rather than including the actual sweets in the game itself. I've played many candy games over the years, so I consider myself somewhat of an expert when it comes to this subject. Having said that, I'm always in the market for MORE candy or chocolate game ideas, so be sure to share yours with us. In the coming days, I'm going to be adding a wide range of games to play that are candy related. Of course, we can't forget the old Candy Land board game, which was one of my favorites as a child. Although candy board games are still a lot of fun, most of the game ideas I'll be posting will be including the use of real candy. I'm sure you're not the least bit surprised, are you? Ha! Ha! Just remember, candy games aren't just for kids! You can incorporate a chocolate game at your baby shower, wedding shower, graduation, or any occasion when you want to loosen up the atmosphere and have a bit of fun. Share A Candy Game Idea! We are always on the lookout for more creative and fun ideas of games using candy to add to the site. If you've come up with something clever or maybe attended a party where a candy/chocolate game was played, don't be stingy, share it with the rest of us! Do you have any pictures of your game preparation or the party itself? Great! Click the button and find it on your computer. Then select it. You can add up to 4 photos.